Agriculture Department Tells Schools To Give Food A Healthy Makeover : Shots - Health News New school nutrition rules aim to boost fruits, veggies and whole grains, while cutting back on salt and fat. And USDA's Tom Vilsack is encouraging schools to try novel approaches to stretch their purchasing power. Second-grader Jonathan Cheng, center, eyes fruits and vegetables at Fairmeadow Elementary School in Palo Alto, Calif., last month. This may come as shock to anyone who hasn't stood in the hot lunch line or watched a certain popular high school sitcom recently, but the school food program is way behind the nutritional times. The stuff on offer is frequently full of starch, fat and salt, and low on whole grains and fresh fruits and vegetables. Coupled with poor food choices at home and low exercise rates, it's literally making our kids sick. So the Department of Agriculture is proposing higher nutritional standards and prodding schools to come up with new ways to make better food on a budget. "There are a number of ways school districts can address this without breaking the bank," Agriculture Secretary Tom Vilsack told reporters on a conference call today. For example, many localities are working with chefs to develop affordable recipes and strategies that feature more fruits and veggies, and make whole grains taste good -- like this program in Washington, D.C.
Vilsack also suggests that school districts consider combining their food orders with neighboring districts or hospitals to make their dollars go further. And there's several hundred million dollars a year up for grabs each year for schools that meet new standards outlined in the child nutrition law Congress passed last month. The actions were met with praise from produce growers. "Fruits and vegetables are the stars of USDA’s goal for healthier school meals, and kids and the produce industry will benefit," said Dr. Lorelei DiSogra, United Fresh vice president of nutrition and health. 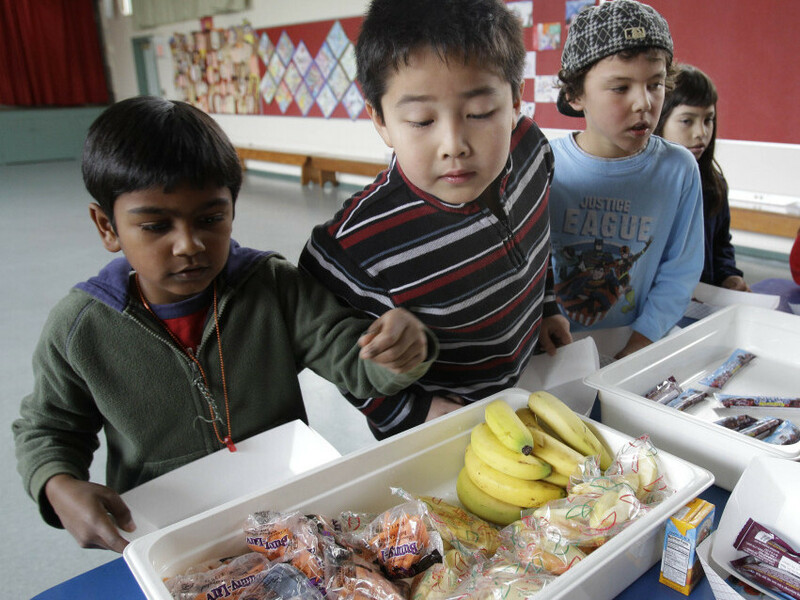 And this from the Center for Science in the Public Interest's Nutrition Policy Director Margo Wootan: "Requiring school lunches to provide more whole grains, fruits, and vegetables will teach kids healthy eating habits that may last a lifetime." But it's still a big challenge, given tight education budgets, inadequate school kitchens, and a lack of staff training. Yet the number of kids who rely on these food programs is higher than ever according to a new report out by the Food Research and Action Center. The new federal nutrition rules aren't perfect. They say nothing about decreasing sugar intake or taking flavored milk off the menu, for instance, but school districts like New York City's are free to take matters into their own hands.